Spyro the Dragon is looking a bit more powerful than we remember him in the upcoming animated feature The Legend of Spyro 3D. 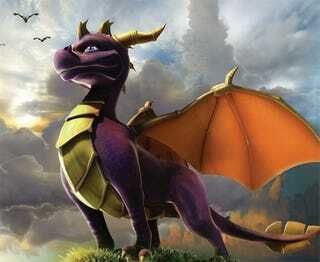 A Spyro fansite (believe it or not) unearthed the teaser poster for the film at the official website of film sales company Velvet Octopus, showing a large, confident-looking version of everyone's favorite little purple dragon. The film, which we've been telling you about since 2007, found a producer last year in the form of Ash R. Shah, who signed a five-picture deal with Velvet Octopus that included the CGI Spyro feature. The teaser poster is very bare, with no information other than that the movie exists. The DarkSpyro fan site has the film listed for a December 2009 release, but as far as I can see that's nowhere near official. As far as stars go, the IMDB entry for the film lists Elijah Wood as Spyro and Gary Oldman as Ignitus, but again, nothing official on that front. So basically, we have an official teaser image, which you can see below. Enjoy it, as it could wind up being the only good thing about the movie.